As many of you know, my dad and I have opposing viewpoints on many controversial topics. Since our discussions frequently get heated and we were on vacation, I tried to avoid discussing controversial topics. Plus, the rest of my family does not feel comfortable engaging in these heated discussions. The below pedestrian safety issues were too much for me to hold my tongue, so my dad and I got into a heated discussion about Vision Zero. For those who do not know what Vision Zero is, the goal of Vision Zero is to achieve zero traffic fatalities. While my dad understands what Vision Zero means, we disagreed on whether it is a realistic goal, who should be held responsible if the goal is not achieved by the agreed upon date, and whether millions of dollars should be invested in a project to prevent one death. My dad and I agreed that the pedestrian crossing flags shown in the below photos show that the government recognizes the safety issue and is trying to resolve the issue. I tried to convince my dad that pedestrian crossing flags have been proven to not prevent crashes. I found several intersections with pedestrian crossing flags on the Big Island. While I saw people walking in urban areas, cars dominated the suburban and rural areas. The Big Island has many pedestrian safety issues. As a conservative, my dad did not want to spend millions to prevent a crash from happening. This was especially true when we saw no one walking, which is seen in the top photo. Kona side of Hawaii Island (aka Big Island). Photo: Ray Atkinson. Since we drove on many highways with few pedestrian and bike crossings on Hawaii Island, we saw many people jaywalking. My dad felt I put too much responsibility on the driver to prevent crashing into the jaywalker and not enough responsibility on the pedestrian. I called him out for victim blaming because he felt the pedestrian should walk out of their way to find a crosswalk, which could be miles away. My dad did not appreciate being told that he was guilty of blaming the victim. Before I proceed, I want to clarify that most of the responsibility to prevent traffic deaths should be on the government. The government, especially the traffic engineer, must approve project designs before they can be built. While my dad wanted me to keep the jaywalking discussion on US law, I kept trying to force us to discuss Dutch law. As this post shows, the Netherlands has no laws about jaywalking. Pedestrians in the Netherlands can legally cross the street anywhere. I would love to see US law changed to allow this! My 2nd cousin (right) and his wife (center) with me at their Honolulu oceanview condo. Since the lighting is horrible, I need to learn how to take better photos. Photo: Ray Atkinson. We found green sea turtles at the Black Sand Beach. Photo: Ray’s dad. I have other photos from my Hawaiian vacation, but I have shared my favorite photos. I am back in Oregon City wearing winter clothes. I enjoyed escaping the cold and gray skies by vacationing in Hawaii, so I plan to do it again someday. “Denver at Eye Level” is a reference to “The City at Eye Level”. As I decide what I want to focus on in my first 2018 Oregon post (what would you like to read about? ), I’m focusing this post on my May 31 layover in Denver. I wasn’t planning to include a layover in Denver on my flight from Charlotte to Portland until I saw how much cheaper flying through Frontier is. While there are many disadvantages to flying through Frontier, which may prevent me from flying through them again, I couldn’t resist getting a free flight with a long daytime (important because I wouldn’t do nighttime layover) layover in Denver out of my flight to Portland. Plus, I got to catch up with Allison Barton, who is my 2nd cousin. She lives in the Denver region and I haven’t seen her in about 15 years! While I'm exhausted from jet lag and being awake for 24 hours by the time I arrive in Portland tonight, I enjoyed exploring Denver and catching up with my cousin. I hadn't seen Allison for about 15 years! Can Denver become a “smart city”? I started my long Denver layover by figuring out transportation. Unfortunately, it isn’t possible in Denver and many other cities to pay for transit and bikeshare using the same fee and use both systems with one app or card. I hope this changes soon as many cities invest in smart city technology. Even though a day transit pass throughout the Portland region costs $5, a day transit pass from the Denver airport costs $9! Since Capital Bikeshare sells single trips for $2 and I only planned to take one or two trips, I was shocked Denver B-cycle doesn’t sell single trips. The cheapest is a day pass for $9! I may be too frugal, but paying $9 for only one or two trips felt too expensive so I ended up walking and riding transit. I also didn’t ride bikeshare because I hadn’t memorized where all the stations are located and where the system limit is. I was concerned I wouldn’t find a station nearby or bike beyond the system limit and not be able to find a station to dock the bike. Due to these concerns, I wish Denver had dockless bikeshare. Most dockless bikeshare companies charge $1/trip. Enough ranting about how I’d improve Denver. I enjoyed many things about Denver. While an almost 14-hour layover may seem like plenty of time to explore Denver, I knew it would be over quickly so I prepared before arriving where I wanted to go. Even on a Thursday during normal work hours, the mile-long 16th Street Mall was busy. I constantly saw the free MallRide shuttle, so it was reliable to use. The following photos show some of the placemaking along the 16th Street Mall. The below photo shows it being used. Proof the piano was used. Proof the chess/checkers board was used. I came across the 9th Street Historic Park while searching for historic sites to visit. Since the park is part of the Metropolitan State University of Denver, many of the historic houses have been converted to university buildings. Every house had this marker. I wish I would’ve had time to visit all the story sites along the Denver Story Trek. While I didn’t find any historic markers to read, Larimer Square is where Denver was founded. View of Larimer Square from 14th Street. Yes, you see a bike signal. There’s a protected bike lane on 14th Street. After walking several miles on a 90-degree day, I enjoyed putting my feet in the cold South Platte River at the Confluence Park. Denver has a cool park to access the water. After walking several miles, my feet are enjoying the cold water on a 90-degree day. I found several protected bike lanes in Denver. Since designing protected bike lanes with a bus stop is often challenging, the below photo shows how Denver did it. I wasn’t even looking for the Alley at the Dairy Block when I was randomly exploring Denver. According to this article, the alley opened in April 2018 and is Downtown Denver’s first activated alley. The alley reminds me of Brevard Court in Uptown Charlotte. I was on my way to meet Allison Baron, who is my 2nd cousin, for dinner when I saw a bus-only lane on Broadway. Since I’ve seen private cars in bus-only lanes in other cities, I was surprised most Denver drivers stayed out of the bus-only lane unless they were turning, which is legal. The bus-only lane is just painted! Do you see “bus only” painted on Broadway and the right turn only except buses sign? Allison pointed out the beautiful Denver sunset over the Rockies as she drove me back to the airport. Since the sunset was on her side of the jeep, I didn’t want to reach my phone over her while she was driving to take a photo so I didn’t get a photo. Denver sunset over the Rockies. Photo: slack12 on Flickr. Since I have lived and worked in Oregon City for over a month, my next post will focus on how I’m feeling with these life changes. As with previous posts that discussed my work life, I plan to only share what can be shared publicly. “Montreal at Eye Level” is a reference to “The City at Eye Level”. While I don’t usually wait a few weeks to write a travel post, I’m glad I waited this time because I learned something disappointing about Montreal after I returned to the US. This disappointment totally changed my perspective on Montreal and how I was planning to write this post. I was originally planning to express my excitement for all the cool placemaking projects and car-free streets. While the projects and car-free streets are still cool, I wish they were all permanent. Many of the innovative placemaking and car-free streets that I was excited to see in Montreal are closing for the winter. Neighborhoods will temporarily lose placemaking projects that make their neighborhood unique and automobiles will return to what I thought were permanent pedestrian malls. Yes, I realize Montreal has long and harsh winters. However, people in Montreal still go outside during the winter so why can’t the placemaking projects and car-free streets continue through the winter? Since Rue Sainte-Catherine is likely Montreal’s most famous pedestrian mall, I’ll start with this example. Why can’t the below street be car-free all year? While Avenue Shamrock remains a one-lane street during the winter, all the placemaking in the below photos close during the winter. I haven’t lived in an environment where placemaking closes during the winter. What do families in Montreal do during the winter to have fun when the chess board and carousel are no longer there? While Place Shamrock closes during the winter, Jean-Talon Market remains open during the winter. Jean-Talon Market is adjacent to Place Shamrock. I’m curious whether the outdoor pianos remain during the winter. I found people playing outdoor pianos throughout Montreal. I’ve never seen so many outdoor pianos anywhere! While I’m disappointed by how many placemaking projects and car-free streets in Montreal are temporary, I’m confident that at least one project is permanent. Some of Montreal’s protected bike lanes are permanent because they are built using concrete barriers instead of temporary posts. Most protected bike lanes in the DC region and throughout the US are temporary because they use posts. Montreal still has protected bike lanes that were built using posts and a parking lane. Unlike many post-protected bike lanes in the US, Montreal drivers don’t appear to park in the bike lane. Surprisingly, this was accomplished with only a few posts and signs. I only see one post and no parking-related signs in the below photo. How many posts and parking-related signs would be in this photo if this bike lane was installed in the US? I realize US cities are trying to use many posts and parking signs to educate the public about where to park and protect cyclists. But how many posts and signs are really needed to accomplish these goals? My one year work anniversary is quickly approaching! While I interned part-time at Oregon Metro for a year during grad school, this is my first full-time work anniversary! My first day at MetroBike was October 25. I plan to reflect on my first year and what I look forward to doing in my second year. Since I can’t publicly share the exact station locations that I have been working on, I plan to share a general overview of how much fun I have had during my first year. Neighborhood Greenways Are Cool, But Oasis Greenways Are Awesome! I submitted my contributor form to Greater Greater Washington (GGWash) today and GGWash’s staff gave me the green light, so my first blog post should be published on GGWash sometime next week. Since GGWash’s staff asked me to write differently than I write on my personal blog, I wanted to share the version I wrote before GGWash’s staff asked me to shorten my blog post and make it less technical. As I wrote in this post, I knew I would have less control over my writing when I started posting on other blogs. I’ll share my GGWash post after it is published, but as a teaser I’m sharing my longer and more technical version below. Update: here is my first GGWash post! A bike boulevard (DC region refers to neighborhood greenway as bike boulevard) is an outdated idea currently being used by many US cities to improve safety for all street users. An oasis greenway is a new approach that represents the future of safe street design. An oasis greenway is a long series of interconnected low-speed, low-volume, shared-space, vegetated linear parks created from an assembly of residential streets. As the below video shows, an oasis greenway is based on the Dutch woonerf. Extremely low traffic volumes, including traffic diversion as needed. While many cities in the US are focused on traffic diversion on a street by street basis, several cities in the Netherlands are focused on traffic diversion on a neighborhood or citywide basis. Houten, Netherlands, which is a suburb of Utrecht, has implemented a citywide traffic diversion plan. As the below map shows, motorists are routed from their neighborhood road (green) onto a connector road (brown) that directs them to the outer ring road (yellow). Motorists must drive all the way around Houten until they reach another connector road that connects them to their destination. Since cyclists and pedestrians can travel through the traffic diverters, they can travel quicker than motorists through Houten. Watch this video to learn more about Houten. Since Houten was originally designed with traffic diversion, it is a unique city because it didn’t need to be retrofitted. Most, if not all, US cities will have to retrofitted with traffic diversion so here is a neighborhood retrofit example from Utrecht, Netherlands. US cities should be able to relate to this retrofit example much easier than the approach that Houten took with its citywide traffic diversion plan. While no US city has implemented a citywide nor neighborhood network of traffic diverters, Portland, OR has several traffic diverters. Here is a diagonal traffic diverter in northeast Portland. Extremely low traffic speeds, including traffic calming as needed. Below is a bayonet traffic calmer in Delftweg, Netherlands. While the street is two-way, the bayonet forces motorists to take turns going through the bayonet. Cyclists have a two-way trail so they can avoid the bayonet. Shared space, without sidewalks, with motorists sharing the space with pedestrians and cyclists, like a woonerf. Oasis greenways must be continuous for at least several blocks and have connectivity through busy intersections. Terminal vista. They must make use of the “terminal vista effect,” where the line of sight straight down the street is partially obscured, usually by trees or an on-street parking chicane. The below woonerf in Delft, Netherlands shows the terminal vista effect. Parklike, which refers to using grasscrete as the default in areas that aren’t travel-ways for cyclists and pedestrians. The below photo from Haarlem, Netherlands shows a grasscrete street. Park and parking strip. They must have a wide area where on-street parking, parklets, trees, vegetation, and play areas are located. Minimal parking footprint. They must minimize the parking footprint based on a parking needs analysis. Use the below illustration to compare parking footprint of a traditional street with parking footprint of an oasis greenway. Small and large play areas. They must have both small and large play areas, with the small play areas referring to the Park & Parking Strip and the large play areas referring to Oasis Greenway sections with “ultra-low volumes” where the play area temporarily becomes the entire cross-section of the street, not too different from when hockey is played in the street. While no street in the US has been designed with all nine elements of an oasis greenway, a few cities have experimented with several elements of an oasis greenway so please don’t think that an oasis greenway can only be designed by the Dutch or Europeans. Would you like to see an oasis greenway constructed in your neighborhood? If yes, where? If no, why not? While the following topic directly relates to my job because I consult for Arlington County, I’m hopeful I have some freedom to be an advocate during my free time. I love being an advocate but also want to keep my job so I’m feeling handcuffed. Even though I’m critiquing my client’s bicycle and pedestrian planning efforts, I’m not critiquing Capital Bikeshare so I assume the following topic is safe to write about. With my background thoughts out of the way, what do you think of when you read “bicycle boulevard”? Did you only think of cyclists and wonder why I’m asking? Even though you may think only having cyclists prioritized on a slow speed neighborhood street is okay, I’m bothered by this. While Arlington has included several pedestrian projects in its bike boulevard plans, the public likely doesn’t realize that pedestrian projects have been included on a bike-specific project. This concerns me and should concern you! While I’m not sure what percent of bike and ped projects are included in the overall bike boulevard plan, I assume that bike projects represent the majority of the projects because the title of the plan is bike boulevards. Even though I’m advocating for a shift from bike boulevards to neighborhood greenways, I have no idea whether this change will actually result in more focus discussions about ped projects. Since changing policy could result in focusing more on ped projects, I recommend Arlington adopt the green transportation hierarchy. According to the green transportation hierarchy, pedestrians should be prioritized over cyclists. While I’m not trying to insinuate that Arlington isn’t prioritizing pedestrians, I am stating that Arlington should use better language if it wants to prioritize pedestrians and attract pedestrian advocates to join the conversation. As the below video shows, Portland has been shifting from bicycle boulevards to neighborhood greenways. I believe one of the reasons why Portland chose to make this shift is because bicycle boulevards are seen as only for cyclists while neighborhood greenways are seen as multimodal. I hope Arlington will follow Portland’s lead and shift from bicycle boulevards to neighborhood greenways so pedestrians can be prioritized more. Since Catherine, who I have been dating for almost two months, thinks tactical urbanism events are awesome, I’m trying to find upcoming tactical urbanism events in the DC region. Even though I showed Catherine photos of tactical urbanism events, I feel you have to experience the event in person to fully understand and enjoy it. I’m hoping to take Catherine to a tactical urbanism event on a future date. While Open Streets DC has a website, I’m disappointed to read “One day a year, let’s open up those streets.” Only one day a year! Plus, I couldn’t find any upcoming open street events on the Open Streets DC website so I’m disappointed. I guess Portland spoiled me with five Sunday Parkways (open street events) each year! While I still plan to write more about my study abroad trip last summer to the Netherlands, I have been surprised by how some people think I am only focused on bike planning. I want to resolve any confusion people may have about my multimodal experience. 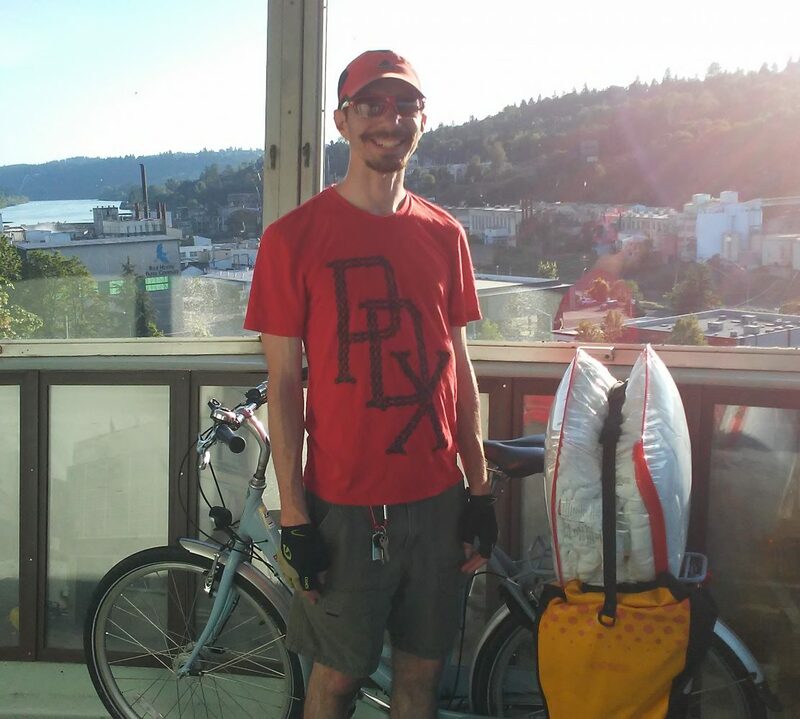 Since my resume mostly shows bike planning experience and this blog is mostly about biking, I have been asked during job interviews whether I have any transportation planning experience beyond bike planning. Some of my bike friends in Portland have told me that they have also been asked this question during job interviews and believe it is a common question for any Portland-based transportation planners applying for jobs outside of Portland. They told me the question is most likely due to the fact that Portland is known mostly for bike planning outside of Portland. Yes, I have extensive experience in transportation planning beyond bike planning. Through this post, I plan to show a variety of transportation planning projects I have worked on. I believe in prioritizing people and creating human-sized cities. In case you are wondering what I mean by “prioritizing people”, read my previous blog post about advocating for people. Since everyone is a pedestrian and pedestrians are a vulnerable road user, I feel it is important to showcase my pedestrian planning work first. While I have worked on many pedestrian planning projects, the biggest pedestrian planning project was my planning workshop project during winter and spring terms at Portland State University. My planning workshop group, which consisted of a total of four Master of Urban and Regional Planning (MURP) students, worked with Tigard, Oregon and State of Place to create a walkability and economic development plan for the Tigard Triangle. If you don’t have time to read the entire plan, I would like to highlight the below map because it shows the importance of the plan. The State of Place Raw Score shows walkability scores for every road segment in the Tigard Triangle. Value per Acre shows economic development opportunities. Through the plan my group created, we prioritized walkability and economic development improvements in the Tigard Triangle. Since everyone already knows I’m passionate about bicycle planning and most of my blog has already been devoted to writing about biking, I’m not going to write much about my bike planning experience. This previous blog post shows a map I helped create during my Transportation Planning Internship at Toole Design Group. Even though I am mostly passionate about pedestrian and bicycle planning, I do have automobile planning experience and do care about motorist safety. After all, motorists are people. During my Transportation Planning Internship at Charlotte DOT, I calculated Level of Service (LOS) for many intersections. One of my goals of calculating LOS was to improve motorist safety. All of my internships have involved pedestrian, bicycle and automobile planning so I don’t have too much experience with transit planning. However, as the below map shows, I did some transit planning during my workshop project. I hope I have convinced you that I have well rounded transportation planning experience. While I am excited that my interview with Perils for Pedestrians from early 2013 has been posted online, I am frustrated that the bicycle and pedestrian safety issue I was interviewed about has become reality. Here is the video, which should be forwarded to when my interview takes place at 10:33. In case you are unfamiliar with Charlotte, I have provided a map below that shows where the Mallard Creek Greenway is closed at North Tryon Street. As you can see, this closure is near an entrance to UNC Charlotte so people commuting from across North Tryon Street have few, if any, safe routes to arrive on campus by walking or biking. As any good advocate does, I took photos of the intersection on February 22, 2013. While looking at the below photo, where should pedestrians and bicyclists safely cross North Tryon Street? If you expected people to safely walk or bike across North Tryon Street, please look at the below photo. Automobiles travel about 50 mph through here. The nearest signalized pedestrian crossing is about 1/3 miles north at Mallard Creek Church Road, but I highly doubt anyone is going to walk that far to use the crosswalk when this section of North Tryon Street has no sidewalks. Would you walk across North Tryon Street? Since I am currently living in Portland, I don’t have photos of the detour. I’m hoping one of my Charlotte friends will help by sending me photos of the detour. Thankfully, I found a University City Partners blog post from July 1, 2014, that discusses the phase one and two detours. The detour during phase one, which started in August 2014 and may have closed in May 2015, involved a temporary detour path along North Tryon Street’s southbound lanes, which were closed to automobile traffic during the detour. The below map shows this temporary detour. State engineer Ron Graham said the greenway detour path traveled up a gravel access road to North Tryon Street and onto a temporary paved path along the edge of the closed southbound lanes to Mallard Creek Church Road. People using the detour path crossed Mallard Creek Church Road and North Tryon Street via existing pedestrian crossing signals. An existing sidewalk led them to the Kirk Farm Fields Park and the start of Mallard Creek Greenway. 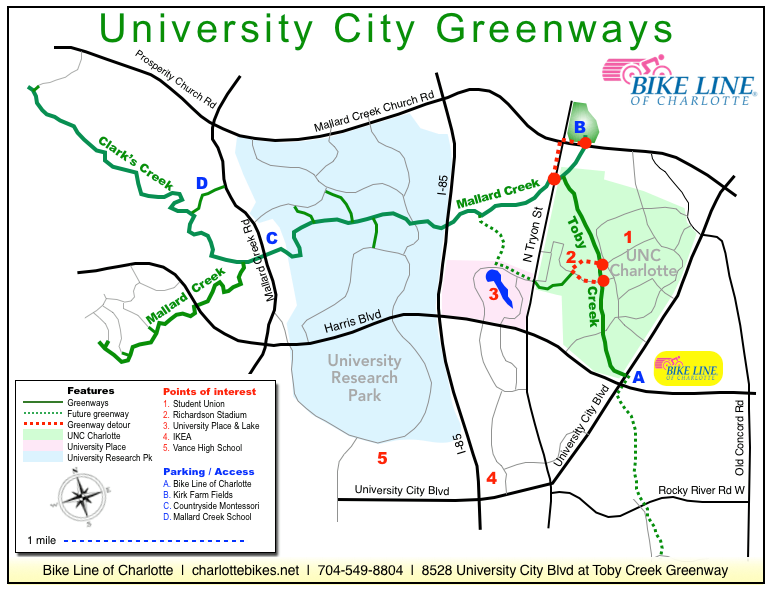 A short walk back up the greenway connected with the Toby Creek Greenway bridge and access to UNC Charlotte. Even though I didn’t see the detour or walk it, I’m impressed with reading this detour. Unfortunately, the phase two detour is very disappointing. According to the blog post, phase two has no detour for pedestrians and bicyclists! Once the state reopens the southbound bridge in May 2015 and reroutes northbound traffic onto the new bridge, the state must close the temporary greenway detour path, Graham says. 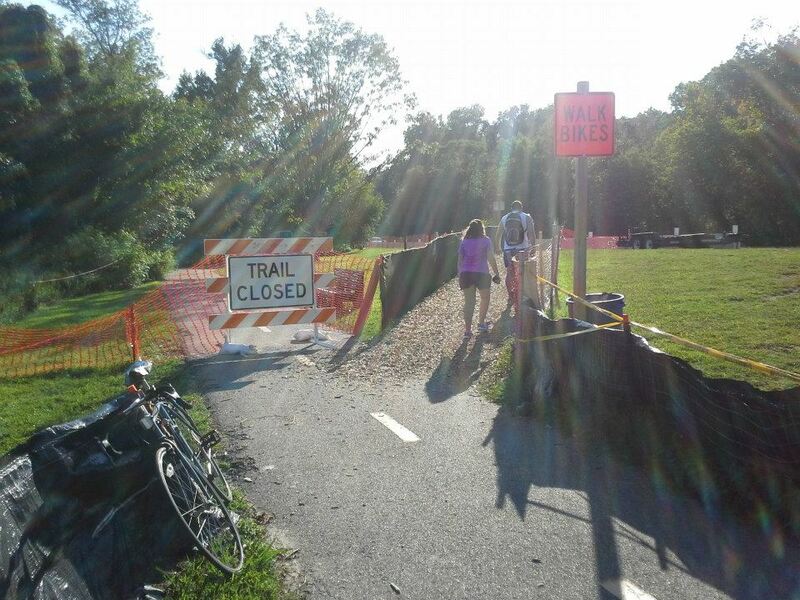 I find it interesting how the state “must” close the temporary greenway detour path. 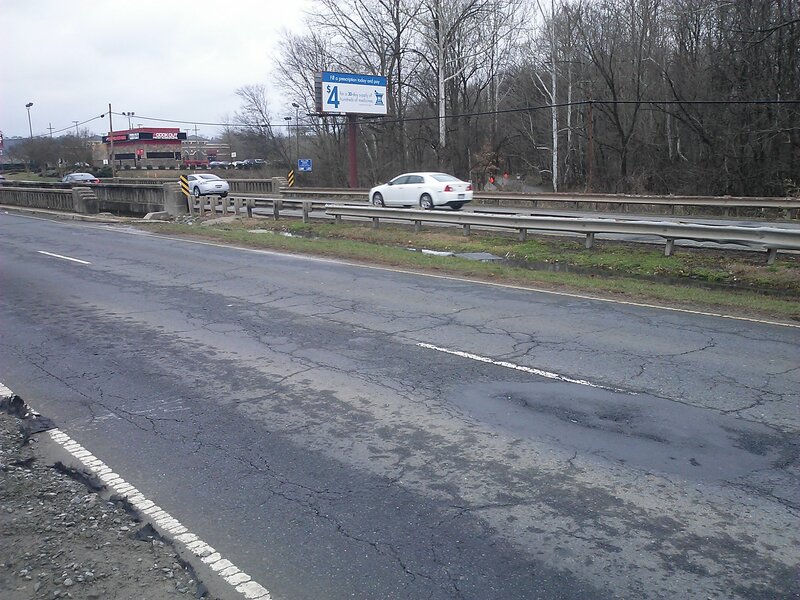 The main reason why NCDOT “must” close it is that NCDOT prioritizes automobiles over walking and bicycling. Since I feel people in the United States often dismiss Dutch and Danish transportation infrastructure because they feel their city is too automobile dependent and doesn’t have funding to spend on bicycle and pedestrian safety projects, I’m very thankful inspiration for my phase two proposal comes from the United States. As I was biking along the Mount Vernon Trail near Fort Hunt National Park in Alexandria, VA on August 17, 2014, I was amazed by the below bicycle and pedestrian detour. To see all 22 photos of the detour, view my facebook album (sharing is set to public so anyone should be able to view it). 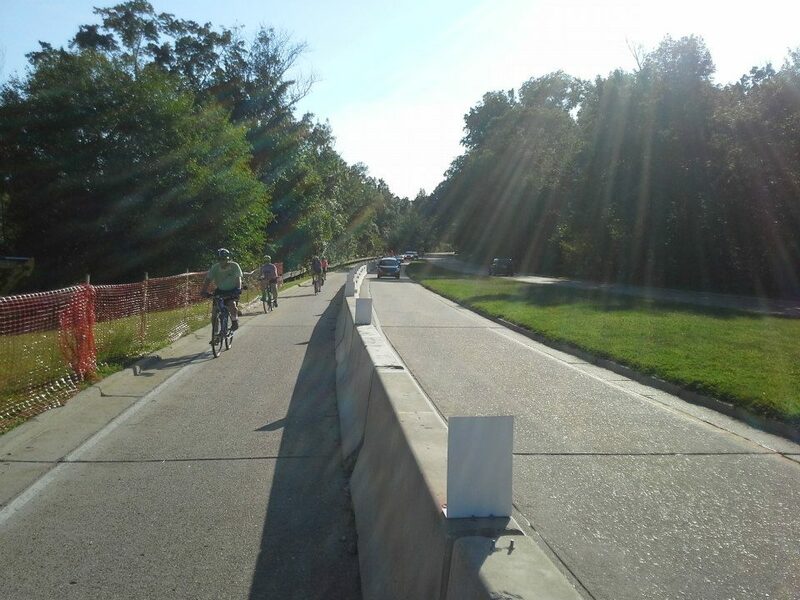 The below photo show the detour being routed onto an entire lane of George Washington Memorial Parkway, which is a state road maintained by the National Park Service. The reasons why I pointed out that it is a state road is because local jurisdictions have less control over what they can do with the road and North Tryon Street is a state maintained road. This is why many jurisdictions try to transfer state roads to city roads. Let’s return to the NCDOT statement where Graham said, “the state must close the temporary greenway detour path.” Another option could have been to close the right southbound lane on North Tryon Street to automobile traffic so cyclists and pedestrians could have safely biked or walked to the signalized intersection at Mallard Creek Church Road. Was this option even discussed? If it was, I’m sure someone at NCDOT said, “motorists are going to hate us if we remove a travel lane!” I’m confident motorists didn’t enjoy having a travel lane removed on the George Washington Memorial Parkway either. 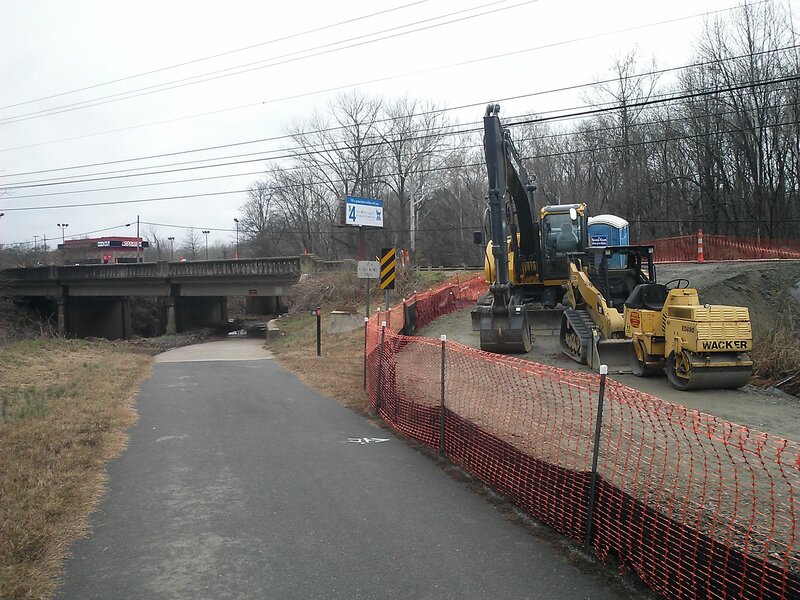 Why did the Mount Vernon Trail have such a great construction detour for bicycle and pedestrian traffic while the Mallard Creek Greenway has no construction detour for bicycle and pedestrian traffic during phase two? John Wetmore informed me about how effective Phoenix’s Traffic Barricade Manual is for requiring contractors to provide a safe and convenient detour for pedestrians through construction zones. Here is a video of his interview with City of Phoenix staff about accommodating pedestrians through construction zones. I plan to update this blog post after getting some photos of the phase two detour from a Charlotte friend and asking Gwen Cook for her thoughts on the feasibility of implementing my proposed detour for phase two.